For dryer efficiency and safety, the shortest and straightest ducting route is always best. Every turn increases friction loss (unless you use non-restrictive elbows). Air velocity reduction from friction loss promotes lint build up and makes the dryer work harder to completely dry each load. Length of run also reduces efficiency. The longer the run, the more friction loss is created which is why building code restricts total run length. Often, going straight up through the roof is the shortest route. 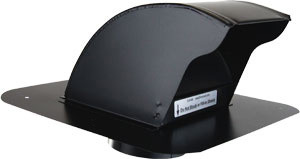 DryerJacks are the first roof vents designed to meet the more stringent venting requirements of dryer exhaust systems. Unlike the vents shown above-left, the DryerJack affects airflow by less than .01 water column inches of pressure. Considering that back pressure higher than .6 WCI is generally recognized as inefficient, you can see that venting through the roof with non-dryer specific vents is immediately problematic. The less back pressure is created by the roof vent, the more efficiently the system performs. The new DryerJack is the most efficient. The position and curvature of the damper, combined with hood size and collar placement, optimize airflow to such a degree that laboratory tests confirm nearly zero reduction in airflow. Terminating the shorter duct run with a DryerJack helps venting through the roof deliver on the promise this shorter route offers. At less than 5 1/2" above the roof plane, it is also low-profile for minimal visibility. For medium snowfall zones and / or higher profile roof tiles, select the larger model 486 which is as efficient but taller. Like the Dryerbox, every DryerJack is made in America with tough materials that look good and install easily.